Hello everyone! Happy 2015 from A! We're sorry for the delays, procrastination was not to blame, but the flu was in my case! I had a long break from my social media accounts since I caught the flu only a day after my birthday. I've gotten over days of fever and shivers. I am now left with a very stubborn cough and sniffles. I've definitely underestimated this year's winter. M on the other hand has been revising for his January exams! We all wish him the greatest of luck and dedicate our prayers to him! Now, let's move on to today's post! Only since a few years ago, the Sultan of Brunei has visited the UK annually. This event is also accompanied by the prestigious Chancellor Scholar awards which are presented by the Sultan himself. Bruneian students all over the UK have been fortunate to experience the ceremonies and also for those that are lucky, even get the opportunity to meet and take photographs with the Brunei Royals! As Brunei citizens, we would attend in our traditional fashion. I didn't get to go to the tailors for my 'baju' to be made last year, so I brainstormed ways to find alternative ways that represent a modern way to wear our traditional 'baju kurung'. A baju kurung, is basically like a long top with a long skirt. In Brunei, this Malay fashion is usually made to fit thanks to a visit to the local tailors. The traditional fashion for women especially has evolved throughout the years. From flowery silk, to butterflies and even laced designs! There are so many ways to fashion your traditional outfit. The fitting as well is diverse, the original would be loose-fitted with a straight cut, while modern styles can be found to be more fitting to the figure for example the peplum style and 'baju kurung fesyen'. Keeping in mind with the main idea of the traditional fashion, I decided to have a go at putting together an outfit without the need to go to the tailors! ASOS Top and Statement Necklace from Sportsgirl Australia // Photo by Zhafir Zamani. I kept the characteristics of the traditional fashion by wearing a long sleeved flowy top. This is a top I got from ASOS. It has a petal-like effect on the front made by the extra layer of fabric which I find elegant and pretty. The sleeves are wide, which is a common style for the traditional tops. I matched my top with a statement necklace. We usually put on our traditional wear for weddings, special occasions and daily work wear. Those attending weddings and occasions would put on striking jewellery for that extra sparkle. Thank you Ellena for the statement necklace! 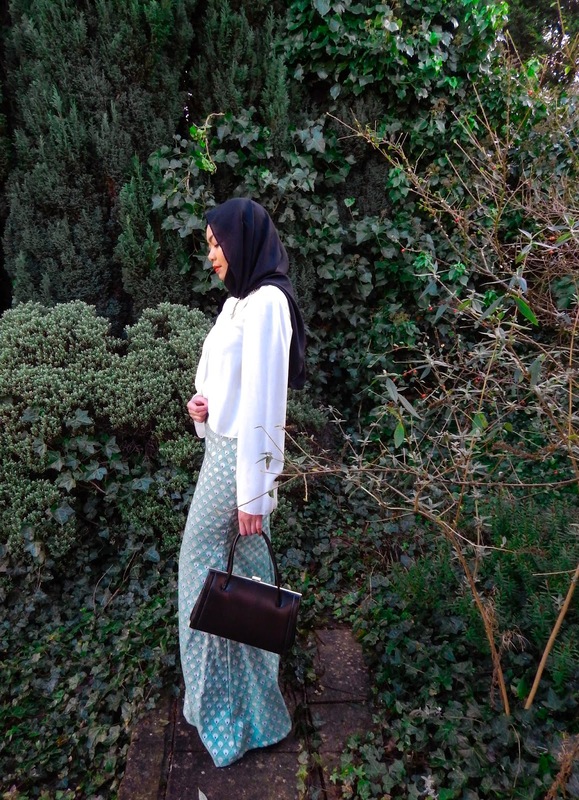 Eleanor Mermaid Skirt by Ana Abu Co. // Photo by Zhafir Zamani. This post is called The Mermaid for a reason! 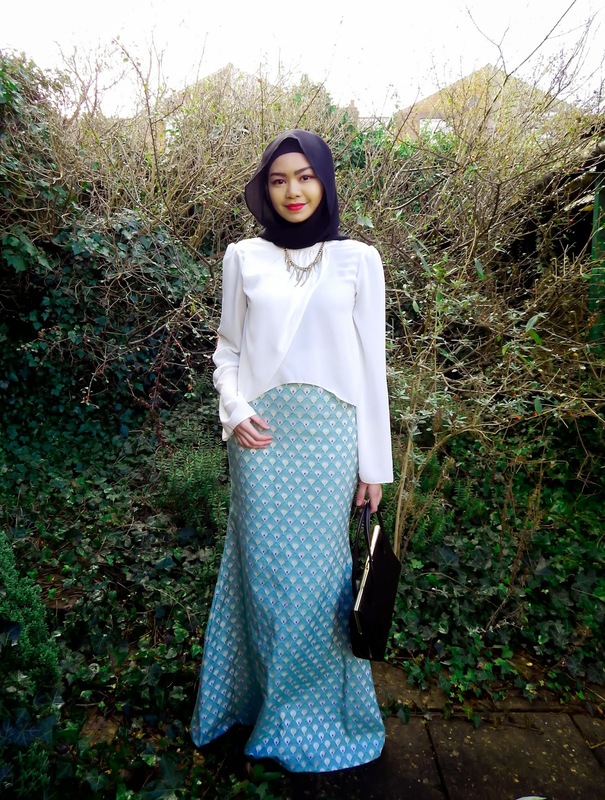 The main piece of this look is this beautiful Eleanor Mermaid Skirt by Ana Abu. I purchased this skirt on their instagram, which you can check out by clicking this link. The scallop detail is my favourite part. The pattern gives off a vintage effect. The fabric is cotton, which is not stretchable. I got this in the size M. It is actually high waisted as well! Which I just love! Anything high waisted, to me, is very slimming! The top I wore is also like a crop top style, which makes this a great combo for that slimming and longer effect! As my outfit was full of lighter shades, we all agreed that a contrasting black hijab would be perfect to complete the look. 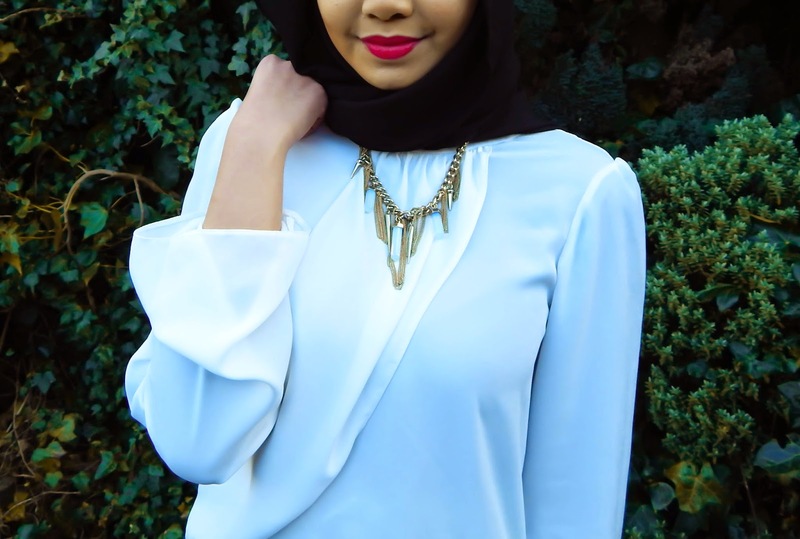 The style I went for with my hijab was very simplistic. I placed both ends on the opposite sides, covering the neck area and pinned the ends together to cover the back. I used the long pins and a safety pin to put the ends together. The top I had on, had a small opening at the back. This style covered the revealing back securely and gave a nice flowing effect. For this shoot I decided to use a black bag I thrifted a while ago. I joined the Vintage & Up-cycling Society in Warwick and we attended a Vintage Fair in Leamington. I didn't wear this in the actual event in London because it wouldn't fit everything I needed for the long day in London. Full outfit // Photo by Zhafir Zamani. Hope you liked my outfit in this post! 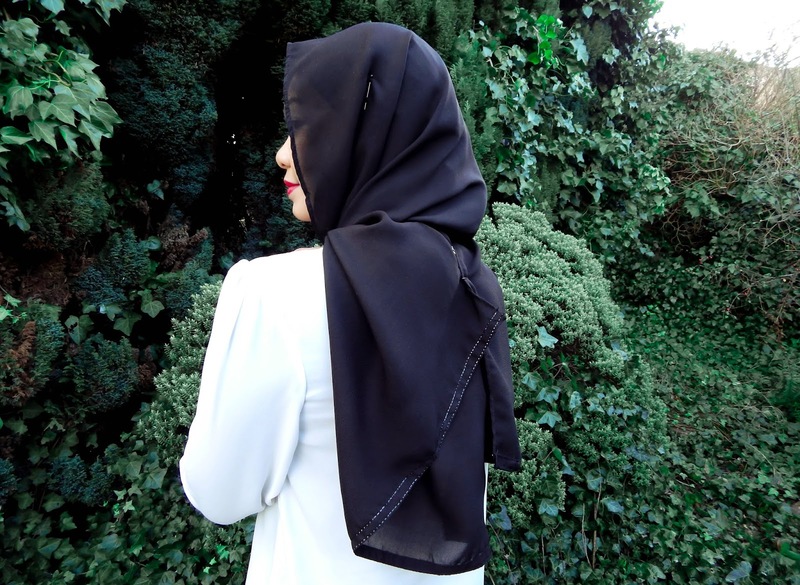 It can be worn for wedding occasions, formal occasions and even for those special Hari Raya open houses! Best part is that you can mix and match with these two pieces and create a whole new outfit! @ London Hilton Hotel December 2014 // Photo by Amin Nordin. Thank you for reading! All the best to those having their exams this January 2015! Fighting!